James Taylor working with young players in the DC area during "block party" festivities. James Taylor began playing chess during the turbulent 60s and adopted the nickname "Black Knight" because none of the books he read as a teenager featured any Black players. Taylor decided to move from Richmond, Virginia to Washington, DC and with him he brought a love of chess. After moving to Washington, DC, he became the 1st Black player to win the DC Amateur Championship and his legend was born. He then set out on a mission… a mission to bring his love for chess to those who would not ordinarily have the interest or the confidence to learn the game. 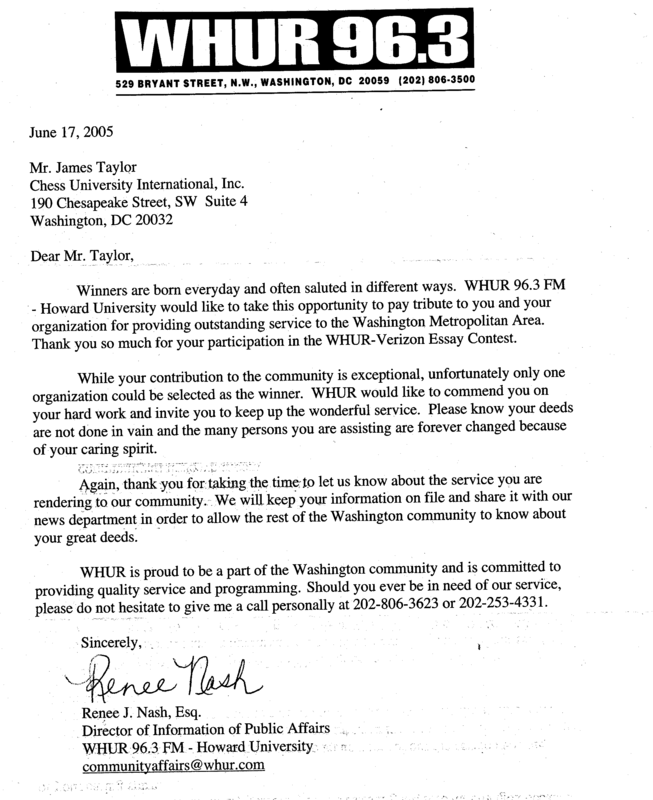 "WHUR would like to commend you on your hard work and invite you to keep up the wonderful service. Please know your deeds are not done in vain and the many persons you are assisting are forever changed because of your caring spirit." According to an interview conducted by Dan Zak, a student writer at American University, Taylor is retired marine and winner of a Bronze Star in Vietnam (see story link below). Taylor's record as a decorated, battle-hardened soldier belies his gentle spirit. "The Black Knight" has provided a shining ray of light in the darkest corners of the DC area. It is without a doubt that the Black community, benefits greatly from the work of men like Taylor. The Chess Drum, "The "Chess University" opens in Washington, DC!" 1 May 2003. 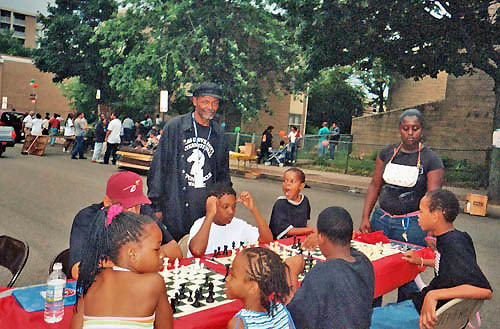 Dan Zak, "Checkmates: Dupont Circle Chess Culture," The Eagle (American University), 7 October 2004. The Chess Drum, "Historic Moments: DC/Maryland Legends," May 2005. 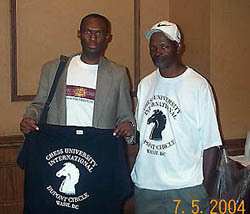 James Taylor (right) presents The Chess Drum's Daaim Shabazz with Chess University t-shirt.